The smallest changes in how we use our bodies can lead to much greater health, physical skill and longevity. In our last monthly Tai-chi workshop we learned important lessons that will help in our Tai-chi practice and any other sport. Rotation of the joints: We often mistake moving a joint around in space for moving the joint itself. For example if we wanted to push we might thrust our hip forward rather than rotating it in place. The sequential movement of the joints within the body, along with the even expansion of the breath, leads to greater force than just throwing your joint at the object you want to push. But it is hard to feel the difference between these two actions, let alone to sequentially move the joints in the proper order to perform the task. This issue is at the heart of learning any sport or activity. The human body is designed to be very powerful in the intricacy of its movement. We tend to substitute brute physical force for the lack of fine motor coordination. Your attention needs to be within the joint itself to move it properly. To often we think of a joint as “over there” because our attention is in our head. Human beings are capable of moving the center of our attention within a part of the body to make it function properly. 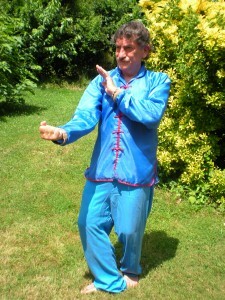 This is an essential part of Tai-chi training. Movement of the low back: I call the low back the “control panel” because its flexibility is essential in initiating any movement. Even the sacrum, whose bones are fused, should be flexible and the coccyx bone (last bone of the spine) should be very active in your movements. But most people have frozen hips and low backs. All their attention to movement is in the upper body. In Tai-chi movement begins at the center of the body and then emanates out into the rest of the torso, legs, arms and head. It is like dropping a pebble into a calm lake. Waves then ripple out in all directions. This keeps the movements centered and the body stable. We pay attention to the central area of the body first, especially the low back and create the movement there so that this part of the body moves first. Our chi-gung system, “zookinesis”, is very effective for developing awareness of and flexibility of the center of the body. There are many exercises that create specific patterns of movement or vibration at the center, which you then allow to flow out through the rest of the body. Relax the abdomens: The degree of relaxation and tension of the abdomens is vital for proper movement. As an example, when you begin to step, the abdomens (on the side of the stepping leg) relax at an even pace. This relaxation helps to extend the leg. You do not extend the leg by using the muscles of that leg. Stepping is a result of the rotation and relaxation of the opposite hip and the relaxation of the abdomens on the same side as the leg. Pelvis as shovel: When you shift from back to front the pelvis acts as a shovel. It first circles back as you shift back, then digs in towards the ground as you begin to shift forward (breathing out). Then it lifts as you finish the shift (breathing in) as if you were throwing the dirt from the shovel on a pile in front of you. This rotation of the pelvis during shifting energizes the center of the body and provides grounding in push hands. It also allows the energy from the torso and legs to interact so your efforts are more efficient. Even walking becomes easier. We learned much more but you will need to come to the workshops to get the full depth of training.